Recollections of Santa | "Granny Beads and Grocery Store Feet"
These things had a LOT of decals! Christmas Eve has been a favorite day of mine for a long, long time. When I was a child, it meant getting up early and driving to Granny Hughes and her jerk second husband’s house in Columbia for a day of food and presents. That was as far as we ever went when I was a kid and driving with Mama for an hour seemed like an adventure. I remember one time, we were coming back in a driving rainstorm and Mama couldn’t see plus she was dead tired and nodding off. I kept putting my hand out the window to collect rainwater and rub on her face to keep her awake. Good times. Good times. By the time I was a car driving teenager, we didn’t have to go to Columbia anymore because Granny had moved in with us. Instead, I’d go hang out with my Aunt Cathy and Uncle Larry and their two sons, Zach and Blake. This particular Christmas Eve, Zach was maybe six years old. Blake was a toddler. 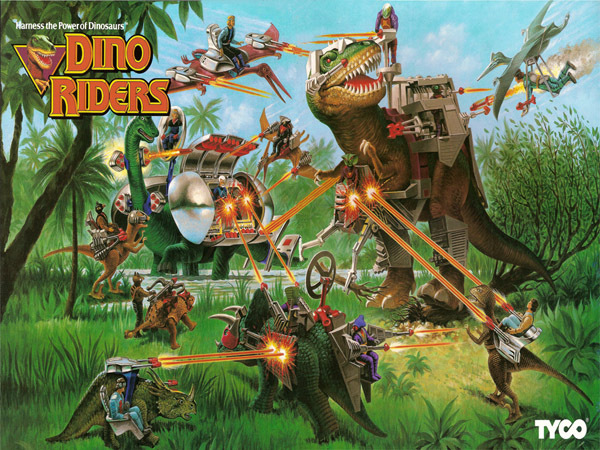 The must have toy for that year was the DinoRider Action Figure collection. Zach was in love with all things DinoRider, so Cathy, like any good mother, had gone out and purchased a tandem axle dump-truck load of DinoRider Action Figures for her tow headed eldest boy. I got to her house about ten on this particular Christmas Eve and the boys were asleep, finally. That was the cue for Cathy, Uncle Larry, and I to put together the “Santa Tableau”. Most of the toys went together easily enough as I recall, but around midnight, we got to the DinoRiders. The box said “some assembly required.” Yeah, right. The figures were all put together, BUT none of them had the correct decals stuck on yet. Those were in a sheet PER BOX about the size of the Webster’s Third Edition International Unabridged Dictionary. I started sticking decals on. To make matters worse, the figures had a molded place EXACTLY where the decals were supposed to go, so if you were the tiniest bit out of line, it stuck out like a sore thumb. I didn’t know I had OCD at that time. I just knew I had to get the stickers on perfectly or it would drive me crazy. If you made a mislick and put a sticker in the wrong place, God help you. I’m convinced that had the Titanic been wrapped with DinoRider decals, she would have split the iceberg and made New York in record time. Those things would stick your eyeballs together just looking at them. Somehow, I managed to stumble into the living room as Zach ran into the midst of half the stockpile of Toys R’ Us arrayed underneath the well decorated tree. Cathy was snapping still pictures and Larry was filming the event with one of the first practical VHS self contained camcorders. Zach, joined a few minutes later by Blake, was so happy and so bouncy that I felt less and less tired. I may even have drank a cup of coffee even though I hated the stuff. It never ceases to amaze me how time gets away from us. That was twenty years ago at least now. Zach is a grown man and the associate pastor of a church in Gainesville, Florida, but he just posted on FaceBook that he’s home safe. I’ll see him tomorrow at Daddy’s house for Christmas supper and I’m thinking it won’t be long until I have to put together a second generation of toys. You see, the little pudgy, tow headed boy of all those years ago gave one of the most beautiful diamond rings I’ve ever seen to one of the sweetest girls I’ve ever met just this past Thanksgiving. Just yesterday, he was beating me awake to come see him play with his toys. This coming Easter, I get to see him marry the girl of his dreams. Don’t forget to wash your feet, y’all, and most of all Merry Christmas! Thanks for this precious story! I love hearing sweet stories about my future husband. What a good cousin you are!